Nashville is known as Music City and more recently hockey city. On the weekend of April 25-27, Nashville will be known as Draft City. The National Football League announced last year that Nashville would be the host of the 2019 NFL draft. Many speculations have been arising from the venues located in downtown Nashville including the Grand Ole Opry, the Music City Center and the Ascend Amphitheater. Last week, the Nashville Convention and Visitors Corp (NCVC) shared details that may put those speculations to sleep. The draft will be held center stage at the intersection of Broadway and First Avenue, which will feature not only the draft selections but performers. After all, it is Music City for a reason. 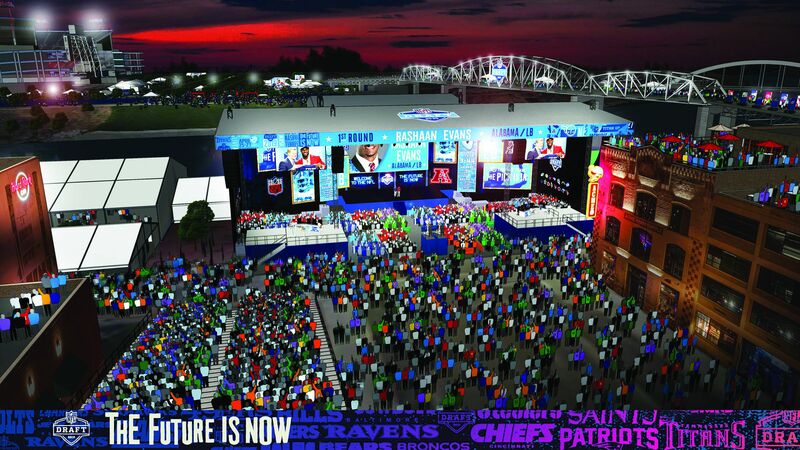 Across the river, at Nissan Stadium, there will be a three-day football festival called the NFL Draft Experience. Unlike previous years, everything will be free to the public. Typically, the NFL draft is held inside a venue where a certain number is allowed to attend. It’s an open concept with it being held outside on Broadway. The NFL is expecting 300,000 people over that three-day span. According to the NCVC, that weekend is already expecting close to 100,000 especially on Saturday. The St. Jude Rock ‘N’ Roll Nashville Marathon and Jimmy Buffett performing in Bridgestone are scheduled for that day. Not to mention, the Nashville Predators could be playing some home playoff hockey that weekend as well. This event will be the biggest of date for Nashville and they are only hoping it continues with a Super Bowl down the road. However, Nashville’s next main focus is becoming a host site for the World Cup. Not bad for a city that has grown so much over the last two and a half decades. This was a city that did not have a professional franchise. A city that was not even close to being on the national map. Then, in 1998 the Tennessee Oilers moved into what was then known as Adelphia Coliseum. The next year was the Music City Miracle and the city was forever changed. That same year, the Nashville Predators took the ice to give Nashville two professional franchises. In the last few years, the Preds have become one of the premier teams in the NHL and have brought national attention to the city. That, coupled with the hospitality and easy access to the downtown area have put Nashville on the national map and a destination for the biggest events known. It is a city that knows how to throw a party and the NFL Draft will be another one of those events.